Glioblastoma is the most frequent and aggressive primary malignant tumor of the central nervous system. The efficacy of antineoplastic drugs that are able to cross the blood-brain barrier is limited mainly by various resistance mechanisms. Hence, local strategies have been developed to improve the therapeutic efficacy. Platinum derivatives and one among them, cisplatin, demonstrated promising results when locally administered into the brain of glioblastoma-bearing rats. A more specific vectorization of the active substance may further promote its accumulation within cancer cells, therefore improving its bioavailability. In this context, biocompatible and biodegradable copolymers that are approved for medical applications can be synthesized without any toxic organic solvents or excipients. Their amphiphilicity, namely the combination of both a hydrophilic and a hydrophobic sequence, is responsible for their spontaneous self-assembly in water. Such a formulation process is simple and flexible. The versatile structure of these drug delivery systems allows imaging moieties to be grafted onto their surface while encapsulating a drug within their core. The diagnosis of glioblastoma relies on magnetic resonance imaging (MRI) after the injection of gadolinium-based contrast agents. Thus, the injection of hybrid nanoplatforms that combine an MRI contrast agent and a drug would enable to non-invasively monitor the biodistribution of the treatment by analyzing the tumor response in real time. Personalized medicine and theranostic applications require similar strategies for the purposes of adjusting the treatment regimen to the patient response. Such smart drug delivery systems were designed by Lajous and coworkers based on amphiphilic block copolymers. Gadolinium complexes were grafted at the end of the hydrophilic chain while a chemical modification of the other block allowed for cisplatin cross-linking with the copolymer backbone. The self-assembly of these functionalized copolymers in water resulted in stable cisplatin cross-linked nanoparticles with a mean size of 100.63 ± 12.04 nm consistent with biological investigations. High field MRI confirmed the intrinsic potential of these hybrid nanoparticles as alternative MRI contrast agents compared to conventional low molar mass Gd-DTPA complexes. Their infusion within the striatum of glioblastoma-bearing mice resulted in a signal that persisted over time. The accumulation of platinum compounds in human glioblastoma cells when treated with these drug delivery systems and the subsequent formation of Pt-DNA adducts was significantly increased in comparison with free cisplatin by up to 50-fold and 32-fold respectively. These results support the potential of this innovative bimodal tool for further applications. 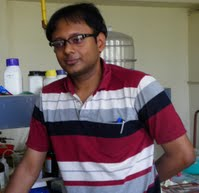 Dr. Sudip Mukherjee is a Web Writer for Biomaterials Science. He is currently a Postdoctoral Research Associate at the Rice University. His research is involved in the development of advanced nanomaterials for drug/gene delivery in cancer theranostics, immunomodulatory applications & angiogenesis. He published a total of ~35 research articles/patents. He serves as International Advisory Board Member for ‘Materials Research Express‘, IOP Sciences. He is an Associate Member (AMRSC) of RSC, UK. He serves as reviewer for several international journals like ChemComm, J Mater Chem A, J Mater Chem B, Journal of Biomedical Nanotechnology, RSC Advances, IOP Nanotechnology, Biofabrication etc.